Please contact Adrian and Tammy if you wish to be an ACTIVE participant of this INDEEP WG. Funding from the Loundsbery Workshop Award 2017 from the Deep-Sea Biology Society and Plymouth University's Marine Institute has enabled a first international workshop on the development of a standardised deep-sea species image catalogue for the North Atlantic, and the development of formalised tools and training materials for new researchers working on field identification of taxa at a regional level. Dr Kerry Howell, University of Plymouth, UK, will lead this new effort for INDEEP to improve data quality and standards in this field. 6th December 2017, Plymouth University, UK. 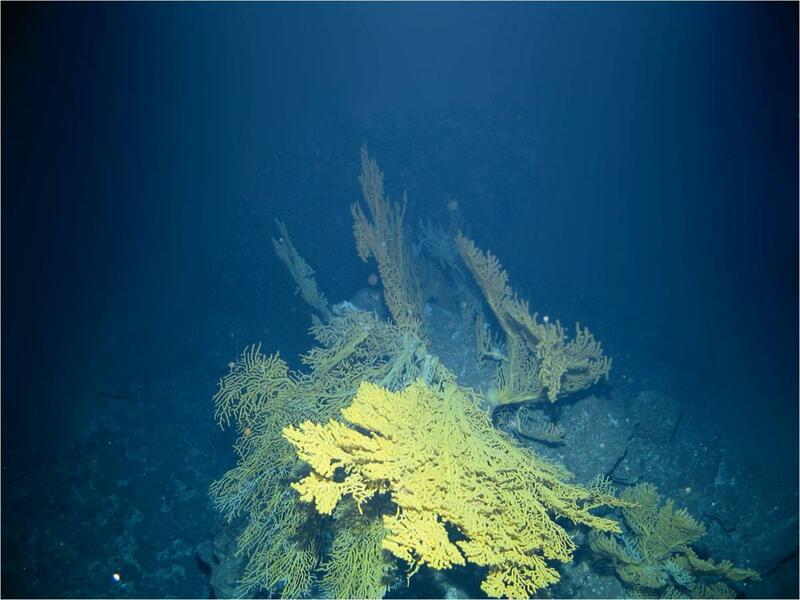 The use of cameras to study the fauna of hard ground regions (seamounts, canyons etc.) and sensitive habitats (cold-water coral reefs) has seen rapid growth over the last 10 years. This growth is set to continue as new robotic and autonomous technology becomes more widely adopted as research tools. The use of images to collect faunal data brings with it the challenge of the identification of taxa from image data. When identifying taxa from image data, well-trained researchers use a combination of traditional taxonomic features and ecological data (e.g. depth, location, knowledge of the local species pool) to arrive at decisions on a taxon ID. This ‘field identification’ skill is often acquired through an ‘oral tradition’ with little in the way of formalised training materials provided to new researchers entering the field. This is a great hindrance to their progress and something the community must address as we move forward into a new era of deep-sea exploration and exploitation. This one day workshop will focus on the field identification of cold water corals. Taxonomic experts will present on the key taxonomic features, visible in images, that can be used to distinguish coral taxa, the level of identification it is ‘safe’ to go to for a particular group, the current status of the taxonomy of key groups, and taxa where further sampling is really needed. Workshop participants will then be given the opportunity to put their new knowledge into practice on image data, and to test their ID skills. The workshop will conclude with a discussion of what the community feels is needed to help raise standards and properly train new researchers. If you are interested in attending this workshop please email: coralworkshop@plymouth.ac.uk to register. Spaces are limited and will operate on a first come first served basis. Travel information is available here https://www.plymouth.ac.uk/your-university/visit/getting-here. There are lots of good B&Bs and hotels around the city centre, Barbican and Hoe, all within easy walking distance of the University. The first version of Deep Sea ID, an iOS field guide app to the marine life of the deep sea, was released in March 2014. This app is now available both for iphone and ipad and for android from the app store. The app has already been downloaded over 35,000 times (as of December 2016) by users from many different countries. The app is the result of a project funded by INDEEP and carried out by personnel from the Natural History Museum, the National Oceanography Centre and the World Register of Marine Species. It allows offline access to the World Register of Deep-Sea Species (WoRDSS) and currently stores on your device the taxonomic information for over 25,000 deep-sea species, over 500 high-resolution photographs of deep-sea specimens as well as links to online taxonomic tools, sources and important references. The app is designed to improve access to taxonomic information for researchers and contractors working at sea or in the laboratory as well as educators and science communicators who wish to learn more about the remarkable diversity of deep-sea life. The app will be regularly updated with more images, and we welcome contributions (see below). All photographs include full credit and contact details and authors retain copyright. For further information on the criteria we have used for inclusion in the database, please read the information on the WoRDSS homepage. The taxonomic information held in the World Register of Deep-Sea Species (WoRDSS) is sourced directly from theWorld Register of Marine Species (WoRMS). WoRMS is managed by an international Steering Committee, a Board of Editors and the IT team at the Flanders Marine Institute (VLIZ) in Belgium. Both the WoRMS and WoRDSS websites are hosted at VLIZ. The species lists and images that are used to create Deep Sea ID are currently maintained at the Natural History Museum in London, UK by Dr Adrian Glover and at the University of Plymouth, UK by Dr Nicholas Higgs. At theNational Oceanography Centre, Southampton, UK, Dr Tammy Horton is contributing to the species lists and coordinating the collation of taxonomic identification resources. Deep Sea ID has been developed by the Natural History Museum, London with the iOS software development by Heathwest Systems Ltd. Contributing Images and Correcting Errors: We are continuously sourcing more images for future versions of the app. Please consider contributing! We also welcome contributions and corrections to the main database. Further information including details on how to contribute new images are available on the WoRDSS website. Please contact us with any questions. WoRDSS is a taxonomic database of deep-sea species based on the World Register of Marine Species (WoRMS). This site was launched in December 2012 as a project of INDEEP. The primary goal of the project is to build a comprehensive database of known deep-sea species and to present this as a thematic species database (TSD) of WoRMS, with all data dynamically linked to WoRMS and their team of taxonomic editors. A secondary goal is to accumulate high quality specimen images of deep-sea species and to present these on both the website and the iOS app (mentioned above) that allows offline-viewing of the complete database and imagery to assist with identifications at sea and in the laboratory. Through WoRDSS, we are also providing taxonomic references (sources) that will allow researchers and educators easier access to identification literature. The WoRDSS project provides an open-access source of quality taxonomic information and imagery on deep-sea species and at the same time enhances the WoRMS database through the provision of images, new soures and editorship. Contributions and corrections are welcome. Three successful projects addressing gaps in WoRDSS (Asellote Isopoda, Holothuroidea & Polychaeta) were undertaken in 2014. The LifeWatch fund and INDEEP financially supported these projects which together have added 30 newly published species to WoRMS, added 1391 new deep-sea distributions to WoRDSS, linked or added over 122 identification references and made available 74 good quality images for use on WoRDSS and the iOS app. In 2016, a further LifeWatch grant funded work on the addition of new information and data for the amphipoda. Special Session "Evolution in the Deep Sea: Origins, Adaptation and Diversity". This INDEEP special session was held in China in October 2014 in conjunction with the World Conference on Marine Biodiversity and brought together a new inter-disciplinary group of scientists to explore how life evolved in the deep and the remarkable adaptations of deep-sea animals. The session attracted 14 oral presentations and a wide audience. An increasingly comprehensive listing of deep-sea taxonomic experts has been produced and is continually updated by Dr Tammy Horton and Dr Maria Baker. It is available on our INDEEP resources page.